Have you ever taken a second chance on love? Recently, I watched the cutest romance movie. 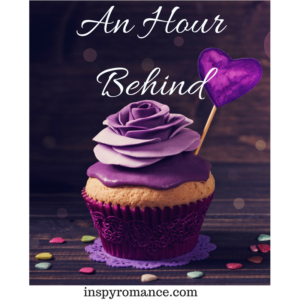 It’s called An Hour Behind and it reminded me of my Bakery Romance Series. When Trish, a cupcake baker, is set up for a blind date for breakfast, she doesn’t arrive on time. Her watch was not set for daylight savings time. When she arrives an hour late, her blind date has already left. She then mistakenly believes that Parker is her blind date since he’s dressed in the same clothing that her blind date was supposed to wear. Parker is initially too stunned to correct Trish’s mistake. 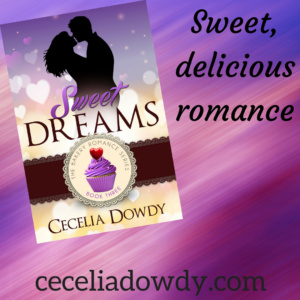 He’s attracted to her and he doesn’t want the magic of their first date to end. The movie tells about the work and love lives of both Trish and Parker. I loved watching Trish bake her delicious cupcakes. Baking is one of my passions and seeing Trish work in her bakery was an added bonus to this nice movie. Parker is a paramedic and you see him interacting with his cronies at the station. Their friendship is sprinkled with false assumptions, second chances and a bit of faith. While watching this movie, you’ll find yourself rooting for both Trish and Parker as they deal with past pains as they get to know each other. An Hour Behind was a movie about dating and second chances. Oh, there’s also a serious cupcake competition. Trish is determined to win, and it’s sweet, literally, to see her prepare her cupcakes for the contest. She’s anxious to win the grand prize. Her dream is to open a second bakery with the prize money – if she wins. I highly recommend this sweet, endearing romance movie. So, have you ever ended a relationship with your significant other and then later given that person a second chance at love? Hi Cecelia, the movie sounds fun, thanks for sharing:) Oh the misunderstandings because of daylight savings- I grew up in state that does not have daylight saving, and now live where we do have it, so there are always quick mental calculations as to what time to call etc. then if we travel north and forget to change our watches…! Hi Cecelia. Having worked in a bakery as a teen, any movie or book with a bakery in the setting is delightful. As a Michigander, we also have daylight savings time and understand the confusion because Indiana and Illinois both are in a different time zone. Indiana is especially confusing since parts of the state has Daylight Savings Time and parts do not. Being 40 miles from where we live, sometimes they have the same time as we do and other times they are an hour earlier. Fortunately I have the cities we visit set on my world clock app on my cell phone. Hubby and I have been married 45 years, so, I have never ended a relationship with your significant other and then later given that person a second chance at love. Best wishes and Happy Writing. Interesting! Thanks for commenting Renate! That World Clock App sounds like it’s a real blessing for you! I’ve never lived in a region that was surrounded by different time zones! I’ve seen this movie and thought it was so cute! Hi, Sherri! Yes, it was a cute movie! So glad you worked things out and married your paramedic! Now I want to see that movie, lol! Thank you for sharing! Hi, Paula Marie! If you see the movie, please let me know what you thought about it! Three months later we were married. Still going strong after 42 years. We never got a chance to break up and get back together. Hi, Janet! So glad to hear your marriage is strong and going on for a long time! Too bad the movie is not on Canadian Netflix. I actually saw it on Amazon Prime. It’s a great movie and if you’re able to watch it someplace then please let me know if you enjoyed it. Is this a Hallmark movie? I record them and watch when I have time. I haven’t seen this one, but it sounds right up my alley. My husband and I play a fun game when daylight savings time goes back in the fall and see who shows up for Sunday school at 10, thinking it’s 11 and they’re coming for church service. Hi, Shannon! Read my comment to Wemble about church! So hard to keep that time straight when you have to be someplace the following morning! Oh, Shannon, no, this is not a Hallmark movie. I watched it on Amazon Prime. I left my husband to go to grad school and then we got back together. It is a relationship with ups and downs. I get discouraged at times reading romance novels as they focus on the tensions before the wedding when life after is infinitely more complex. How do we keep adjusting our expectations and actions? So many seasons of love and second chances. Sounds a fun movie, Cecelia and a different kind of cure meet! I’ve turned up for work two hours early because I moved my clock the wrong way! Hi, Autumn! Yes, it was a cute meet movie! You showed up for work 2 hours early! oh my! That sounds like a cute movie! I’m a sucker for the cheesy romance stories.